“This repatriation is not going to be sustainable,” Abdur Rahim, a leader of Arakan Rohingya Society for Peace and Human Rights, said. Bangladesh on Wednesday was preparing to go ahead with the planned repatriation of hundreds of thousands of Rohingya refugees who last year fled a violent military crackdown in Myanmar, despite concerns over their safety. The plans to send Rohingya refugees back to Myanmar gathered momentum, with reports of Bangladesh armed forces gathering in the Cox’s Bazar camps and allegations that refugees were assaulted by the authorities for refusing to cooperate, according to a report in the Guardian. The first phase of the Rohingya’s return to Myanmar will begin on Thursday, according to an agreement signed between the two countries on November 23, 2017. “We have seen their concerns, but so far the decision has not been changed,” Refugee Relief and Repatriation Commissioner Abul Kalam told Efe news. The two governments agreed to repatriate 2,251 of some 723,000 Rohingya refugees living in camps in Cox’s Bazaar of Bangladesh. The Army, police and paramilitary troops moved into several of the camps in Bangladesh, where over 700,000 Rohingya have been living after fleeing a campaign of violence, described as genocide by a UN fact-finding mission. According to the Guardian, there have been reports of Bangladesh camp officials assaulting Rohingya refugees who refused to cooperate, in a sign that the repatriations may not be voluntary, despite multiple assurances by Bangladesh that it would not force any Rohingya to go back. Meanwhile, UN High Commissioner for Human Rights Michelle Bachelet on Tuesday urged Bangladesh to halt the plan, warning that the repatriation would violate international law and put the lives of the refugees at serious risk. Rohingya leaders echoed those concerns, saying it was too soon to start the repatriation. “They (the Myanmar authorities) are going to keep people in camps,” he said. Another community leader, Dil Mohammad, said the situation in Myanmar was not yet conducive for the refugees’ return. 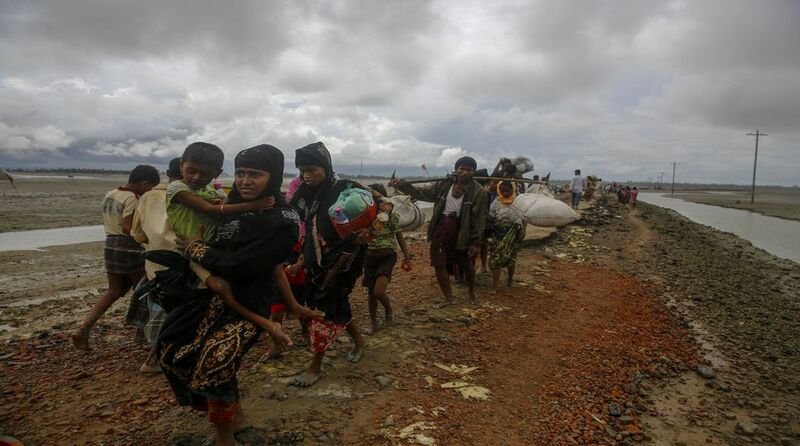 Spokesman of UN High Commissioner for Refugees (UNHCR) Firas Al-Khateeb said that they started assessing “the voluntariness of the refugees cleared for return to Myanmar to ascertain if they would like to exercise their right to return at this time”. The Rohingya exodus began on August 25, 2017 when a rebel group of the mostly Muslim minority community launched a series of attacks on government posts in Rakhine state in western Myanmar. The Myanmar Army responded with an offensive that has been condemned globally, with the UNHCR saying it had all the attributes of ethnic cleansing and bore elements of genocide.